In this year’s Spring Statement, the Chancellor had an opportunity to address the devastating impact of eight years of austerity on public services. However, he rejected calls to announce the end of austerity. In Scotland, Ruth Davidson hailed the budget as a ‘win’ for her MPs. Some argue that the Conservatives' historic strength has been their adaptability. Depending on circumstance, they have been Europhile and Eurosceptic, statist and laissez-faire, isolationist and interventionist. The challenge in Scotland, is trying to convince us they support better public services while saying nothing about austerity. My local Tory MSP’s newsletter is full of his campaigns to get the Scottish Government and the local council to improve various local services. More should be spent on this, that or another public service. Absolutely right, but you won’t find a similar plea for the Chancellor to end austerity, the underlying cause of all these spending cuts. The Scottish Conservatives at a national level are not exempt from this double-speak. I have gone back through their press releases over the past six months. There are numerous calls for more spending on NHS Scotland. Spending on mental health services, particularly services for children, is apparently inadequate. So is spending on GP services, A&E departments, doctor training, smoking cessation, care of veterans, ambulances, drug and alcohol services, cancer services and various drug treatments. Not to mention complaining about bed cuts in several hospitals. Thanking our members for their efforts during the 70th anniversary celebrations is all well and good, but ending austerity funding would be even better. Local government is also underfunded according to the Scottish Conservatives. It is, but austerity isn’t going to pay for their £100m ‘pothole fund’, or stop councils having to dig into their reserves, as the Tories have helpfully highlighted! It is also somewhat less than credible to argue for a cut in business rates and complain about Council tax increases – all of which would add to council cuts. In education, they have complained about falling teacher numbers, cuts in FE colleges, while also asking for extra spending on textbooks. They want to ensure that foundation apprenticeships are a part of every single Scottish school’s offer by 2020. They have also highlighted underfunding of the early years expansion, which although true, will not be solved under the austerity policies of their party. There are regular press releases claiming the Scottish Government is ‘soft on crime’, calling for longer sentences without any understanding that prison spending is way above the European average and a huge wasteful burden on public spending. They attack community alternatives to prison that actually work and are more cost effective. They complain about police numbers falling and the fire service budget, but not about austerity. 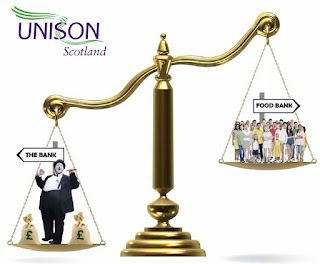 Of course, the Scottish Government now has the powers to address austerity. However, the Scottish Conservatives haven’t urged them to do so, instead they have opposed tax increases for the better off. If parliament had voted for their tax policies, funding for public services would be cut by £335m. I understand the de-toxification strategy and many of the press releases highlight legitimate concerns about public services. However, you cannot avoid the reality that services are stretched largely because of austerity. An unwillingness to say anything about that is simply hypocritical. Facing two ways might make a nice local leaflet, but it does nothing for political credibility.